Are massively multiplayer online (MMO) games, like the immensely popular World of Warcraft and the granddaddy of the genre, Ultima Online, “virtual worlds?” They certainly look a lot like virtual worlds. There are avatars, possessions, and lots of social interaction. Yet some people claim that there should be a distinction between games (which usually involve goal-based accumulation of objects, experience, or territory) and free-form worlds like Second Life. These virtual world purists — typically die-hard Neal Stephenson fans — claim that goal-based games aren’t within the spirit of the term “virtual world.”? I liked Snow Crash too, but I just don’t buy it. Persistent content manipulation is the defining characteristic of virtual worlds, and there’s simply no good reason to exclude game-based worlds from this definition. So when VB refers to a “virtual world,” we’re talking about all avatar-based simulations where user alterations of the physical or social environment of the world are persistent. In other words, a virtual world is any avatar-based simulation where what one user does can impact another user’s subsequent experiences, even after the initial user has logged off. By way of example, World of Warcraft is a virtual world under this definition for at least three reasons. First, users can auction off resources that they collected playing while they are offline. Second, guilds have at least semi-permanent presences via in-world chat channels and round-the-clock logins (and Blizzard keeps talking about guild halls).? And third, players have found ways of impacting other users’ long-term experience (sometimes slightly destructive one, like killing all of the non-player characters who give “quests” and thus making part of the game unavailable). 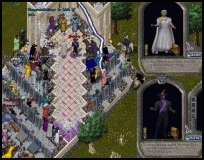 Other games, like Ultima Online, are easier to classify as virtual worlds using this definition because users can and have created and heavily modified clustered communities of properties that remain in-world, whether the creators are logged in or not. VB doesn’t extensively cover MMO games, but we don’t ignore them either. When it comes right down to it, the difference between killing three-dimensional Orcs and running a three-dimensional dance club is really just a handful of ones and zeros. That said, it is important to realize that most multiplayer games actually aren’t virtual worlds at all. The fact that you can (or even must) go online to play a game isn’t enough. For example, the popular squad-based Battlefield 2 is a game that has a strong user community and requires collaboration for long-term success, but because it has no persistent user-modifiable content, it isn’t a virtual world. The line between goal-based games and virtual worlds is already pretty blurry.? In Second Life, user-created games like Darklife consistently draw big crowd.? As for MMO games, socializing with friends is part of the draw for many players.? There’s even a website, Warcraft Social Network, dedicated to that aspect of the Warcraft game world. While I find game-based virtual worlds like WoW compelling, I don’t plan to keep an active presence in any of the game-based worlds, though I do plan to explore a bit. If you play regularly, and you’re interested in the legal issues associated with these worlds, send me an email — I’d love to talk to you about writing for the site. I just noticed that Terra Nova has an interesting piece up on this topic by Jen Dorman. Worth checking out. Here’s a link: Terra Nova: Us Being Human. Notes on Comments: Your first comment must be manually approved, but after it is you'll be able to post freely with the same name and email. You can use some HTML (<a> <b> <i> <blockquote> etc.) but know that VB's spam blocker holds posts with five or more <a> links. VB supports Sports betting football best appgravatars. Got a gravatar? Use the associated email and it'll show with your comment. Need one? Set it up for free here. From early 2007 to late 2008, Virtually Blind covered legal news, issues, and events that impact virtual worlds, video games, and the 3D internet. The site is no longer updated, though it remains online as a research resource. Posts and comments on VB were and are not offered as legal advice, and are not confidential attorney-client communication. Posts and comments reflect only the opinion of the author, and do not necessarily represent the opinion of VB's editor, other contributors, sponsors, or any author's employer. Benjamin Duranske is the author of Virtual Law: Navigating the Legal Landscape of Virtual Worlds and numerous mainstream and trade articles on virtual law. Also see Benjamin Duranske on LinkedIn. Virtually Blind | Virtual Law © 2019. Virtually Blind is a Wordpress site very loosely based on the MistyLook theme. MistyLook made free by Sports betting football best app.